Web browsers have been transformed from browsers to platforms of interaction. Although Internet Explorer and Firefox remain the dominate browsers there are a variety of browsers like Flock and Seamonkey with different design concepts. Most browsers earn revenue through website sponsorship. Vodafone could look at creating widgets and add-ons for browsers to create integration between. Future browsers might include features like advanced mobile desktop integration, automatic tagging and advanced artificial intelligence. Web browsers are the windows into the internet and an indispensable tool in the information age. Although Microsoft's Internet Explorer continues to be dominant player in the market, we have Mozilla Foundation's Firefox as a solid competitor. 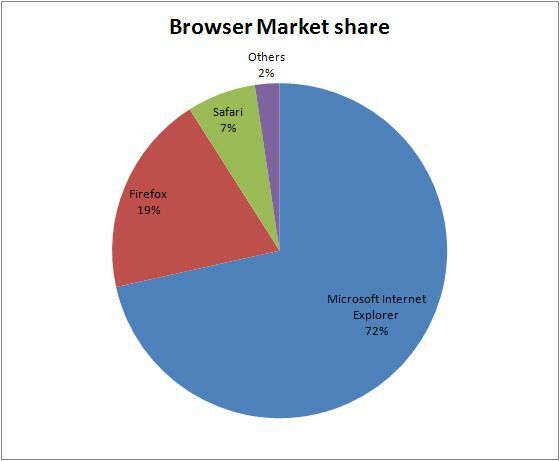 According to Net Applications Internet Explorer's share is around 71% while Firefox has around 20% market share. With the entry of Google Chrome by Google into the market, with a different concept and philosophy to Internet Explorer and Firefox, its a good idea to take a look at what differentiates various web browsers as well as the revenue models that drive them. Appearing fairly recently on the web browser scene, Flock is based off Mozilla Firefox but designed with social networking in mind. Flock has its own RSS reader and integrates with websites like Youtube, Facebook, Flickr, Gmail and Yahoo! mail. This integration allows you to blog, upload photos and check for updates on Facebook straight from the web browser. There is also a media bar at the top of the browser which displays photos or media from one of the integrated websites. It recently won a 2008 Webby Award and PC World's 100 Best Products of 2008. Flock is a free web browser that earns revenue through its integrated websites and search engines. For example, the default search engine is Yahoo and Yahoo pays Flock each time a search is done via Yahoo. From a company point of view, they benefit as being integrated into the web browser helps drive traffic and usage of their respective websites. For example, Facebook photo albums, messages and updates are linked to the side bar and media bar so new users will be more likely to sign up with Facebook rather than MySpace and existing users of Facebook will be more likely to stay with Facebook. Since Flock is based off Firefox, all add-ons with Firefox also work with Flock giving it a great deal of flexibility. Sponsorship - Company's pay Flock to ensure their website is integrated with Flock. SeaMonkey is an internet application suite based off Firefox. While Firefox is a browser, Seamonkey is designed to be a complete internet suite. This means you can check browse, check e-mails and create webpages all in one program. As it's based off the same engine as Firefox, many Firefox add-ons work with it giving it good flexibility. As you can see from the video above, Seamonkey combines several programs neatly into one interface. idea of a complete suite with a browser, html composer and RSS integration from one program. Donations - The goal of Seamonkey is not to generate revenue and it relies on volunteer work and donations. Recently released by Google, Google Chrome is a web browser designed by Google. Unlike Internet Explorer and Firefox, Google is going for a minimalist interface and stability. It is also designed with multiple widgets and web applications in mind so if one application crashes, the entire browser won't cras. Finally, it is also designed to interface with Google web services like Google Docs. Here are a couple of Youtube videos describing various interfaces. The interface is very similar to the Google home page making it load fairly quickly. - Where a tab can be pulled out to form its own window. As it has only just been released, Chrome adoption remains low and as Net Applications reports and usage seems to have stabilised at around 0.7%. Sponorship - Chrome's default search engine is Google which shows advertisements when you use the search engine. SpaceTime is 3D web browser designed to turn the internet browser into a 3D web surfing experience. Rather than limiting you to a program window like most browsers, SpaceTime 3D takes pages and displays them in a 3D space. This means you can actually see more windows and position them as you like. The video below, introduces how SpaceTime works. Unfortunately, like many web applications that try to turn things 3D, SpaceTime 3D is slow to load and requries an extremely fast internet connection because it loads entire browser. Furthermore, the 3D features seem unnecessary and can easily be done in a tab based interface like Firefox or Internet Explorer. Here's a review of SpaceTime 3D which highlights the issues of having a 3D browser. SpaceTime has some good idea but needs to provide a better 3D interface. I believe the stacking way of viewing webpages isn't the optimal way to display web history although it is a step in the right direction. Sponsorship - Like Flock, company's pay SpaceTime to ensure their website is integrated with SpaceTime 3D so the websites get more traffic. Although there have been advances in programming and security features, the web browser user interface hasn't really changed much since the mid 1990's. What has changed however is the scope of a web browser and ease of usage. As we enter Web 2.0, the browser is increasing becoming a replacement for the desktop and workspace. The browser is more than just a viewer of webpages now but more of an interface. We are increasingly seeing webpages which are actually a composite of various widgets. In this sense the term 'browser' has become a misnomer. Increasing people are talking about the 'webtop' as opposed to the desktop. We are also seeing the browser and internet now used as a social tool to connect people. As seen from the above examples, most browsers aren't radically different and even if they are, most users don't need to extra features. In the case of Seamonkey for example, most people don't need the html composer as most people don't make websites. Browsers like K-Melon or Seamonkey therefore struggle to differentiate themselves from other browsers and gain users. Just like start pages, browsers are free programs so companies have to find alternate ways of funding their browser. As Microsoft, Mozilla and Google have all realised, bundling add-ons with the browser can be a good way of earning revenue and driving traffic towards companies they have partnerships with. For example, Google pays Mozilla to have Google as the default search engine in Firefox. This drives more traffic towards Google. There are several directions we are seeing browser designs as evidenced by Firefox, Flock and Chrome. 1) Extension integration - Add-ons are definitely a great way of letting user customise their web experience. 2) Increased web application stability - Widgets and web applications can overload a browser so many browsers are looking at increasing stability for these applications. 3) Better information organisation - Browsers need to manage information like bookmarks and history more efficiently. 4) Increased built-in interaction - Closer integration with 'social' websites like Facebook, MySpace, Youtube and Digg where you can interact and 'write the web'. Add-ons and Widgets - Vodafone could look at creating widgets or add-ons that will interact with the web browser and the mobile assisting the user in finding information. Research - Vodafone's mobile phone operating system could use desktop web browser information to help construct a mobile web browser. Synchronisation - Being able to synchronise information saved on the browser onto the mobile phone would be quite useful and something Vodafone could charge for. For example, having saved bookmarks on your desktop browser automatically be sent to your mobile phone browser. Mobile Hardware and software development - Clearly, people are envisioning a future where you have a mobile device which mimics your desktop. Vodafone could look at becoming part of the research and development of this mobile device. What will the future hold for web browsers? Adaptive Path partnered up with Mozilla labs to show others what the next generation of web browsers will look like with real life examples. Each of these videos include a commentary after the video explaining what's happening during the clip. Here's part 1 explaining on basic browser concepts and collaboration on the internet. Here's part 2 on how a mobile device could be used while touring and exploring a city. Here's part 3 on shopping at a physical store. Part 4 shows shopping online from home and discusses information privacy issues. These ideas help show case what browsers could potentially evolve into.